Want great ideas for using up the leftovers in your fridge? These recipes can be made with any type of cooked chicken, whether it was baked, roasted, fried, grilled, or poached. Of course, you needn't have cooked the bird yourself—all of these recipes work for rotisserie chicken from the grocery store, too. If you're starting with chicken that was breaded or cooked in a sauce, just scrape off the coating or crumbs before using. 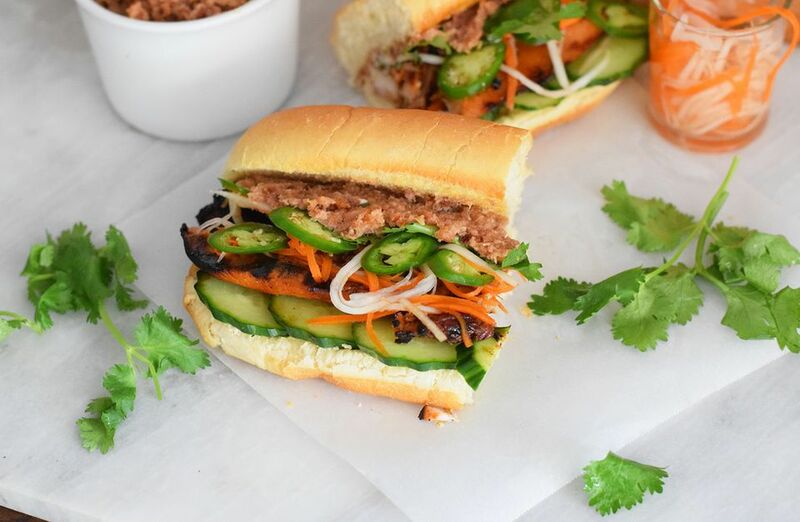 Banh mi is a tasty Vietnamese sandwich that typically includes some type of meat, pate, pickled veggies, and fresh herbs. This mouth-watering version calls marinated chicken breast made from scratch, but you can easily swap in leftovers as a quick replacement. Leftover chicken is the perfect starting point for this dinner salad, also featuring carrots and almonds in a tangy, Middle Eastern-style yogurt dressing. Serve with pita wedges for a nutritious and filling meal. Save money on takeout when you cook up this creamy Thai soup from scratch. Traditional Southeast Asian ingredients—including lemongrass, kaffir limes leaves, red chilies, and galangal or ginger—deliver huge flavor, with coconut milk making it a rich bowlful. This hot chicken casserole with the popular taste of Buffalo chicken wings is always a hit at parties and potlucks. Sour cream, condensed cream of chicken soup, tater tots, and pepper jack cheese complet the crowd-friendly dish. Serve up comfort when you make this luscious chicken pot pie for family dinner. Leftover cooked chicken meat, a refrigerated pie crust, and frozen mixed vegetables make this one-hour recipe easier, but it tastes like you spent all day making it. Dark chicken meat from juicy legs and thighs are a fabulous addition to this delicious wrap flavored with Thai ingredient, including sweet chili sauce, coconut milk, soy sauce, and chunky peanut butter. Make this weeknight dish on your stove top when you need to get dinner ready in a hurry. Seasoned long grain rice is dressed up with crunchy pecans and precooked chicken cubes in a simple recipe that uses pantry staples and cooks in about 30 minutes. Pizza is a terrific way to use leftover chicken because you don't need a lot of meat to make a difference. Layer it onto a ready-made pizza crust with plenty of cheese, a few veggie toppings, and your favorite barbecue sauce for a super easy weeknight dinner the whole family will love. Chicken quesadillas make an easy weekday lunch or satisfying after-school snack. Shredded chicken is layered with cheese in flour tortillas, then quickly browned in a lightly-oiled pan to melt the cheese. Add some green onions, chopped tomatoes, or jalapenos, if you like, for extra color and flavor. Busy weeknights just got more delicious with this chicken alfredo pasta bake that is easy to assemble and cooks in well under an hour. Diced breast, jarred sauce, curly pasta noodles, Parmesan cheese, and a little milk are all that's needed. These chicken sandwiches start with cooked chicken. Mild breast meat works best for these sammies, which also call for some mayonnaise, hard boiled egg, onion, celery, relish, and your favorite bread or rolls. Spring asparagus adds a wonderful fresh flavor to this creamy chowder, which includes tender potato chunks for great texture. Loads of heavy cream makes this soup velvety and rich. It's great for warming stomachs on rainy, cool days. Cook up an Italian-style sandwich with leftover cooked chicken, pre-cooked bacon, and store-bought pesto sauce. Don't have a panini grill? Simply heat your sammie for a few minutes on each side in a non-stick pan, pressing it down with a heavier pan set on top. Canned chipotle peppers give this chicken salad a terrific smoky flavor, while chopped fresh vegetables add great crunch. A combination of dark and white meat works well in this recipe, which can be served over spinach or romaine greens, or sandwiched between slices of your favorite bread. Takeout-style fried rice is so easy to make, it's sure to become a go-to recipe in your household. Leftover rice is quickly stir-fried in soy sauce with diced chicken and any fresh or frozen veggies you have on hand for a quick and easy weeknight dinner. Mild, green salsa verde is the secret ingredient in these scrumptious chicken enchiladas. Buy it jarred for pouring over flour tortillas that are filled with pre-cooked chicken and cheese and baked in the oven until they are hot, melty, and ready to enjoy. Arborio rice cooked slowly in a bath of white wine, butter, and chicken stock (store-bought is fine), is made even better with the addition of shredded chicken bits and Parmesan cheese at the end. Mushrooms would make a great addition, too—just add them with the shallots. If you have five minutes, you've got enough time to make this Indian-style soup. Condensed soup and pre-cooked chicken means it's a snap to heat and serve, and the creamy texture and aromatic curry flavoring makes it heavenly to enjoy. Using precooked chicken in this soup, along with store-bought ramen noodles, means you can have soul-soothing homemade soup in minutes. Feel free to use prepared broth or stock, too! Chicken tacos flavored with a Buffalo wing sauce boosted by heavy cream are guaranteed to become a buffet party favorite! Blue cheese salad dressing and ripe avocado slices add even more decadent richness to every bite. Creamy artichoke soup makes a fabulous lunch or a light dinner when served with crackers. Chunks of boiled potatoes, steamed artichokes, and other veggies are pureed, then combined with shredded chicken, cream, and Parmesan cheese for a filling bowl. Savory filled crepes are special enough to impress at a dinner party, but simple to prepare. All you need is precooked chicken, canned water chestnuts, and an addictive sauce made from condensed cream of mushroom soup. Tropical mango slices and coconut shreds mingle in a Thai-inspired dressing in this delightful salad with crunchy fresh vegetables, peanuts or cashews, fresh basil strips, and tender chunks of cooked chicken. Kids love these deep-fried chicken bites with a golden-brown exterior and creamy mixture on the inside. A simple white sauce is mixed with chicken, onion, and fresh parsley to create the filling. This easy five-ingredient appetizer "pizza" is made with prepared barbecue sauce, French bread as the crust, three kinds of cheese, and leftover cooked chicken. Green goddess dressing is the star of this pasta salad made with frozen peas, Havarti cheese cubes, and a trio of bell peppers. You could make your own dressing, but store-bought will do just fine, and this recipe shows you how to tweak it by whisking in some added mayonnaise, Greek yogurt, and zingy lemon juice. Raisin bread makes an unusual, but delightful base for this Waldorf-inspired chicken sandwich with a tasty mayonnaise and honey-mustard dressing. Canned or precooked chicken is mixed with diced celery, walnuts, dried cranberries, and chopped apples to make the sandwich filling. When is a salad more than a salad? When it's a fully-loaded Cobb chock full of tender chicken, creamy avocado, salty bacon, hard-boiled egg, blue cheese, lettuce, and tomato. Pasta salad with chicken and vegetables is always welcome at picnics and potluck lunches. Spinach, tomato, red bell pepper, and red onion are tossed with canned or chopped cooked chicken in a tangy mayonnaise-and-Dijon dressing. 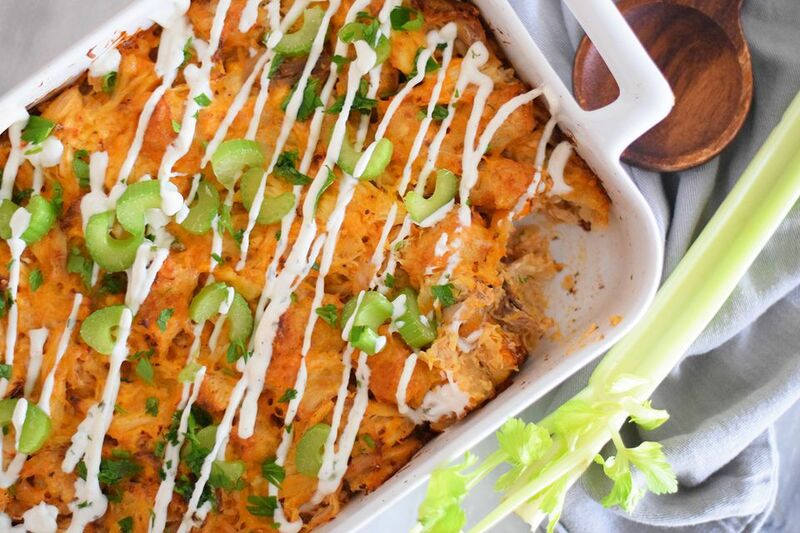 This family-friendly casserole is a delicious option when you've got lots of leftover chicken. It goes into a classic macaroni and cheese bake with a simple homemade cheddar sauce, some thawed frozen spinach, and a crunchy breadcrumb topping.